I planted some cabbage and kale in my garden, and I am already seeing holes in the leaves. My friend suggested using Bt on the plants to prevent damage. I always hear about genetically-modified Bt corn in the news. Since Bt corn is GMO corn, doesn’t that mean that Bt is a bad thing? Great question. I can see why using Bt might be confusing, but it is a great organic insecticide. All cole crops attract the attention of some sort of cabbage lepidoptera (cabbage looper, cabbage webworm, cross-striped cabbageworm, diamondback moth caterpillar, imported cabbageworm) almost immediately…even while still in the 4-packs! The moths or butterflies lay their eggs on the leaves, a baby caterpillar emerges and starts eating AND eating AND eating some more. All it does is eat and poop.Eventually it gets “too big for its britches” and must shed its skin several times to continue to grow and reach maturity. If you were to compare a caterpillar’s growth rate to a human baby; the newborn human baby would be the size of a school bus within two weeks of birth! You can handpick caterpillars from the plants, but honestly I have never been super-successful with that method and tend to live with holes in my greens. However Bt, or Bacillus thuringiensis, is extremely useful on cole crops (Brussels sprouts, broccoli, cabbage, cauliflower, collards, kale, kohlrabi, mustard, turnip, etc.). 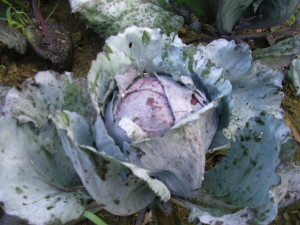 For decades organic gardeners and farmers have used Bt as an organic pesticide to effectively target soft-bodied caterpillars (i.e those cabbage worms). 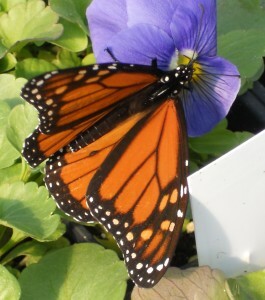 Spraying the plant by coating all sides of the leaves – as opposed to dusting – is most effective because the caterpillar has to EAT the Bt for the pesticide to work. Since Bt is not a broad spectrum insecticide, it is a softer means of insect control and breaks down quickly. A naturally occurring soil bacterium,Bacillus thuringiensis(Bt) was first discovered and isolated by a Japanese scientist, Shigetane Ishiwatari, in 1901 because it was compromising silkworm populations. In 1919 a German scientist rediscovered Bt, and developed for use in targeting flour moths. Scientists found that a protein crystal in Bt affects the caterpillars intestine, causing death once ingested. This toxin does not harm humans and other vertebrates. Organicgrowers have been using Bt since the 1950’s. By the 1980’s many insect larvae had become resistant to synthetic pesticides, so many conventional farmers switched to using the Bt bacterium. It continues to be widely used by both organic and conventional farmers across the globe as a natural pesticide. 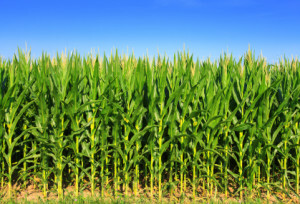 In 1995, the first Bt Corn was registered with the US Environmental Protection Agency. Bt soybeans, Bt potatoes, Bt cotton, and numerous Bt corns are currently registered with the EPA, and some registrations do not expire until 2022. This means that Bt has been engineered/spliced into the genetic material of corn itself and is effectively in every bite the insect eats (or we eat). In contrast, organic farmers spray Bt directly onto the plant. It can be washed off by rain, by time, or when you clean your vegetables at your sink. Just eighteen years after the first GMO corn was approved, around 70% of foods found on the grocery store shelves include GMO ingredients, and88% of USA-grown corn is GMO corn – which is used in numerous supermarket products and in animal feed (which we end up eating as meat, dairy, or eggs). Imagine how many of our processed foods contain hard-to-avoid corn syrup. The bulk of US commodities now planted are Bt Engineered crops. From the start organic farmers and gardeners have been seriously concerned that Bt corn and other Bt crops would create insect resistance to Bt overall, and diminish the effectiveness of one of the primary and most effective organic insecticides available for use by organic growers. Unfortunately, this is already happening and even the GMO scientists are scrambling to keep the Bt strains effective. The EPA has increased its refuge recommendations for Bt corn growers – who must now plant a band of host plants that do not produce Bt toxins to promote and foster the survival of susceptible pests – and extend the usefulness of Bt as an insecticide. Corn is pollinated by wind movements and gravity, and each corn plant produces 4-5 million grains of pollen. Corn pollen goes where the wind blows. GMO corn pollen can easily contaminate neighboring corn crops and the seed produced by those crops. For organic farmers, and conventional farmers who export to countries that will not accept GMO corn, this is a huge problem. A farmer could potentially lose her entire crop and future seed source – because cross-pollination with a GMO corn has rendered the crop unsellable. This should represent a huge liability for the GMO tech companies (the party responsible for introducing the contamination), but it hasn’t. Generally it has been the producer who has suffered losses and even been sued by seed-tech companies for “stealing” the GMO technology. In response, organic seed companies are developing pollen-blocking corn hybrids. Bt corn residues and associated Cry1Ab proteins are widely distributed and persistent in the headwater streams of the Corn Belt landscape, and can be measured in the water column 6 months after harvest. In testing 69 pregnant and non-pregnant women who were eating a typical Canadian diet – researchers found Bt toxin (Cry1Ab) from GMO crops in: 93 percent of maternal blood samples, 80 percent of fetal blood samples, 69 percent of non-pregnant women blood samples. Swiss researchers found that the Bacillus thuringiensis (Bt) toxin Cry1Ab produced for pesticidal purposes by genetically modified (GM) Bt maize increases mortality in the young ladybird larvae. GMO maize consumption can affect the kidney and liver, and somewhat affect the heart, adrenal glands, spleen, and our blood production system. Female rats fed Roundup-Ready GMO Corn died 2-3 times more than controls. Male rats presented 4 times more large palpable tumors than controls. Corn rootworm resistance to Bt hybrids has been documented. Roundup-Ready crops have spurred nearly 20 roundup-resistant super-weeds including roundup-resistant horseweed, waterhemp, and giant ragweed. ; and weed scientists are now recommending the application of stronger herbicides along with Roundup. What about the Monarch Butterfly? Initially Bt corn was named as detrimental to the monarch butterfly. Now most Extension sites state that the monarchs are negligibly affected by Bt corn, but there is lots of evidence that monarchs, other Lepidoptera, and pollinators are dramatically affected by the GMO Roundup-Ready crops planted on millions of acres in the USA. Why? Roundup has killed all the butterfly host pants that would normally be found in fields and field borders (milkweed for example) so habitat has been dramatically diminished. According to Dr. Chip Taylor, Director of Monarch Watch, “Once HT [herbicide-tolerant] crops [came to] represent 40% of the total acreage, we began noticing a significant decline in the monarch population.” Dr. Taylor and his colleagues estimate that 160 million acres of habitat, or roughly 20% of the breeding range of eastern monarchs, has been lost as a result of the introduction of HT corn and soybeans. “The monarch migration is absolutely spectacular,” explained Dr. Taylor. “But the monarch population is declining, and World Wildlife Fund has declared the monarch migration endangered. This winter, the monarch overwintering population in Mexico is likely to be the lowest ever recorded [less than 100 million butterflies]. Habitat loss is a major concern, because the USA loses 6000 acres per day of habitat for pollinators and beneficial insects. Know it is OK to use Bt in your organic garden. Grow your own organic food. Vote with your dollar. Buy organic food for your family’s good health, the environment, and the freedom to choose what you eat. Support local organic farmers. Create pollinator-friendly habitats in your yard, and in your community. Pressure national and local politicians to label and regulate GMO foods. Bill – Thanks for the question! 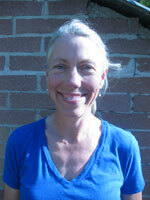 Ruth Gonzalez is a former market farmer, gardener, local food advocate, and founder of the Tailgate Market Fan Club where she blogs at http://tailgatemarketfanclub.wordpress.com. In her job at Reems Creek Nursery, Ruth offers advice on all sorts of gardening questions, and benefits daily from the wisdom of local gardeners. Thanks for this informative piece! The issue of whether the BT spray is safe, was confusing. Can you explain how “organic seed companies are developing pollen-blocking corn hybrids” is not producing a GMO? Hey Nathan! Thanks for your comment. Genetically, hybrids are entirely different from genetic modification. I’d really encourage you to read this blog post about genetic modification to help you understand the difference between it and traditional breeding. It’s a very important distinction! Also, here’s a really great article by Civil Eats pertaining to this new project. Can bacterium Bacillus thuringiensis be put directly in your vegetable garden soil to combat beetle grubs? Also, is milky spore safe to put in your vegetable garden soil?